Keeps Water Out & Holds Ear Plugs In! Keep the water out and hold your ear plugs in! Ear Band-It is an adjustable headband designed to hold ear plugs or ear molds in place while engaging in water activities. It's recommended by doctors, pediatricians and audiologists for anyone with ear tubes and for swimmer's ear prevention. Great alternative to bathing caps, which are unsightly, uncomfortable, and often times ineffective in protecting the ears. The latex-free neoprene Ear Band-It offers comfort and ear protection for water-lovers of all ages. It's helpful for those who have swimmer's ear, perforations, or simply do not like to get water in their ears, and may also be used for bathing. It comes in five colors (Royal Blue, Red, Purple, Teal and Magenta) and three sizes (Small, Medium and Large.) See SIZE CHART below. 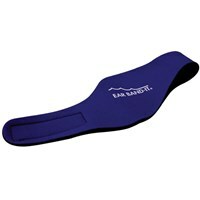 - Ear Band-It is made of neoprene, which is not waterproof. Although it will keep the majority of water out of the ear canal, the purpose of the band is to hold ear plugs or ear molds in place to form a watertight system. - Do not swim or bathe with a hearing aid if wearing the Ear Band-It, as your hearing aid may become wet and damaged. 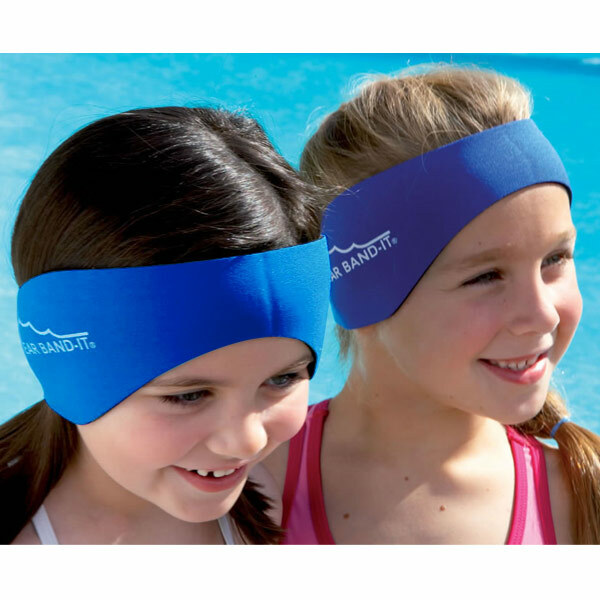 - Diving head first with the Ear Band-It is not recommended, as it may come off the head. (Although if it does come off, it will float for easy retrieval.) Swimming and jumping in the water feet first are not a problem. Small: Band Size: 19.5"; Fits Head Sizes: 15-19"; Ages 1-3 yrs. Medium: Band Size: 21.5"; Fits Head Sizes: 17-21.5"; Ages 4-9 yrs. To select the appropriate size, measure around the top of the forehead (at the hairline) in the front, over the middle of the ears and around the bottom of the hairline in the back. Measure under the wearer's hair, if possible. This simulates how the Ear Band-It is worn and provides the best accuracy.